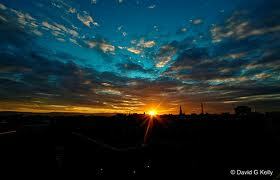 Dublin, lies on Dublin Bay and overlooks the Irish sea that divides Ireland and Great Britain. The city ranks among the top tourist destinations in Europe and in the last decade there has been an economic boom, which has seen areas of Dublin change dramatically. Dublin is filled with beautiful period buildings with elegant Georgian architecture. Dublin Airport is the busiest airport in Ireland and one of the ten busiest in Europe, with average passenger traffic of 60,000 people per day, rising to 80,000 at peak travel times. It is situated about 10km north of the city centre and provides a number of transport options, including hundreds of daily bus and coach services operated by companies such as Dublin Bus, Air Link, Urbus and Bus Eireann. Travellers who would rather go by car can find taxis on the forecourts directly outside terminals one and two or hire a vehicle from firms such as Hertz, Budget and Avis. Aer Lingus, Air France and Lufthansa are among the carriers based at Dublin Airport, providing access to the destination from several destinations throughout the UK and Europe, including London, Glasgow and Berlin. 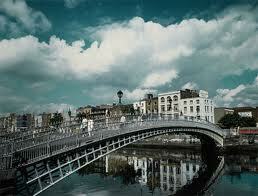 Dublin is Ireland's capital city and is situated on the estuary of the Liffey river on the island's east coast. The city itself spans a land area of some 115 sq km and is home to some 1.7 million people in the wider metropolitan area. Banking, finance, IT and construction are among the capital's biggest industries, although tourism also makes a substantial contribution to the local economy. Dublin can trace its history back to the ninth century AD, when it was established as a Viking settlement. It remained so until a Norman invasion of Ireland was launched from Wales in 1169. Visitors interested in learning more about the city's history can head to some of its landmarks and monuments, which date back hundreds of years. Another interesting theme that travellers might want to explore is Dublin's literary heritage, with the likes of Oscar Wilde, James Joyce and Samuel Beckett all hailing from the city. One of the first stops for many people touring the Irish capital's historic sites will be Dublin Castle, which is situated at a strategic point at the junction between the Liffey and the Poddle tributary. A castle has stood at this location since the 12th century, although most of the complex as it appears today dates from the 1700s. The National Museum of Ireland also offers a fascinating journey back in time, with a range of exhibits and artefacts associated with Irish art, culture and natural history. The museum has three branches in Dublin. At the Writers Museum, guests can explore the lives and work of some of the city's most esteemed literary celebrities. Books, letters, portraits and personal belongings associated with figures such as George Bernard Shaw and WB Yeats are among the items on display. Another distinctive aspect of Irish culture and history is celebrated at the Guinness Storehouse. Visitors to this site - which is Ireland's number one visitor attraction - can learn everything they ever wanted to know about Guinness. Families and animal lovers spending some time in Ireland's capital city might be interested in visiting Dublin Zoo. Opened in 1830, the zoo is the largest in the country and is home to everything from snakes and crocodiles to elephants and chimpanzees. By picking up a copy of the Thirsty Travellers pub guide and discount card, visitors can find out about some of Dublin's unique drinking establishments and where to find them. The guide lists dozens of pubs throughout the capital, including the oldest in Ireland, the smallest in the city and the venues offering the best traditional music, Guinness, Irish coffee and whiskey. Dublin has a relatively mild maritime climate, with warm summers regularly offering temperatures climbing into the 20s in degrees C from May to August. People who want to minimise the risk of wet weather would be advised to avoid travelling in December and January.